'You either love it or you hate it', 'be prepared for a culture shock', 'the poverty is overwhelming', 'beware of Delhi belly!' 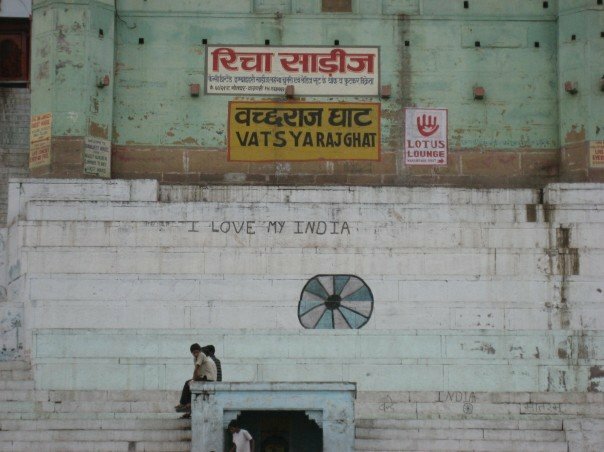 these are all things that people say when they hear you are going to India and to a degree they are all true. However, having been many times before, both alone and with family, friends, and Chris, I was pretty sure I knew what to expect and that I was going to LOVE it. Strangely this was not initially the case on this visit and for once I saw the side of India that people who 'hate' the place, or who can't quite stand the chaos, must experience, its 'dark' side if you like. As I type this (a couple of months ago now!) Chris is in the UK. He flew back from Kathmandu to see his parents for a few days and we decided that it would be best if I carried on with our plans and made my way to India where he would meet me on his return. I could have just waited it out in beautiful, laid-back Nepal but he was keen that I not hang around and get on with seeing some things whilst he was away. The bus journey from Kathmandu to the border town of Sunauli was stunning. As we wound down mountain roads alongside roaring rivers to the flat lands of the Terai region, Himalayas gleaming in the background, the thought of leaving the place actually tore at my heart strings. I've been to a fair number of countries and few have this effect on me. Nepal is truly a special place and I can understand why so many people return there time and time again, captivated by it's magic. The people are amongst the kindest I have ever met; entirely selfless and generous to the extreme, never expecting anything in return, a quality which is rare in today's world and is ironically most often found amongst those who have the least. Unfortunately Bhairawa, the nearest town to the border, was not so lovely and had an entirely different effect. The train system in India is complicated and peculiar. You can book and cancel tickets at will, with virtually no consequences. As a result, people book up seats months in advance and it is the norm to be waitlisted on trains, (particularly popular routes) only to be confirmed with a place a mere few hours before departure. I had booked up several waitlisted tickets to numerous destinations in the hope of getting just one. On arrival in Bhairawa I found out that I had finally been confirmed on a train to...well...anywhere (Kolkata in this instance), and made the snap decision not to visit Lumbini the next day (the birth place of Buddha), but to get on my way to India and get that train! Hassle free border crossing, tick. Bus to train station on the other side, tick. Gorakhpur, most hideous town I have literally ever been to in my life, tick. Unfortunately I did not even dare get my camera out to document this hell hole of a place but suffice to say I have never been anywhere so dirty and stinking in all my puff! I had been planning to get some food there before my 24 hr train to Kolkata but skipped breakfast, lunch and dinner that day and bought a packet of crisps instead. Needless to say, stuck there for a few hours waiting for a long train ride, being stared at by literally hundreds of Indian men, tummy rumbling and feeling all alone, I felt pretty homesick and totally understood why some people can't stand India. The incessant staring, hassle, filth, mass of people and animals, and noise makes it a pretty difficult place to be sometimes. Funnily enough I later met a couple who had also been stuck in Gorakhpur, not for a few hours, but a whole night. It put them off India so much that they went straight to Kolkata and flew out 3 days later...perhaps a little hasty but I sympathised with them no end and my experiences there certainly opened my eyes up to an India that I had hitherto not understood or had managed to close my eyes to. Goat herding in the city centre - as you do! Despite the intial intro a good night's sleep in Kolkata, some food to boost my blood sugar and morale and a day spent wandering the streets of the city soon brought back my love for this incredible country. I don't know why I love it, but I just feel this joy in my bones when I am here. It is such a vibrant, colourful place. There is poverty and filth at every turn, I can't deny that, but it is also true that everywhere you look something interesting and enterprising is going on. There is always a stunnning view or a crumbling architerctural delight to admire and whilst not everyone is as overtly friendly as they could be there is still a sense that you are never alone and would always find a helping hand, somewhere in the crowds. This was illustrated aptly one day when, on a busy street, I stopped to take a photo leaning against a metal railing. What I had failed to notice amongst the masses was that someone was painting said railing, a lovely shade of red. When I moved away I had paint all over me. I started laughing and was soon surrounded by hundreds of staring faces also smiling and laughing at my stupidity. Another few seconds and a man appeared with a rag and some diesel oil (nice!) to wipe it off my skin, looking at me like I was half witted. In India, perhaps more than anywhere else, it really is the small things that get you through the day, pull you back from the brink of despair and exhaustion and keep you coming back for more. I am concerned in more than a few points in this article. I include had to put on my thinking cap to take in and consider some of this unique thinking. Thank you for sharing this useful information.